These unhappy guests want the spotlight off the couple and on them. They pick on every detail of the wedding, complain, interfere and refuse to help or accept any role in the day’s activities, unless they are the center of attention. To deal with it: Remind the diva(s) that it’s not their day, behave civilly or depart the event. Take the meaning of “open bar” literally, gets blotto and hits on the mother of the bride, the bridesmaids and the bartender? Attempts a head stand on the head table while singing John Legend’s “All Of Me”? To deal with it: Service or event staff remove him/her to another room away from guests until sobriety returns or sleep takes over. The wannabe performer who can’t carry a tune in a rusty bucket insists on serenading you and your guests. To deal with it: Your professional wedding singer gently but firmly takes the microphone and sings the same song, showing the amateur how the pros do it while showing the wannabe to their seat. Inviting children opens the door to misbehavior, mischief and their parents insisting their angels are perfectly behaved. NOT inviting children invites their parents’ disbelief, disgust and ditching your invitation. To deal with it: Set aside a children’s play/rest area near the reception, so parents can enjoy and keep an eye on their kids. The incorrect menu, not enough food, a fallen wedding cake, overwhelmed servers and the bar running out of the liquor you ordered. To deal with it: Get catering and wedding cake recommendations from friends and visit their shops. Try their food, ask to contact previous clients. Make sure their facilities can accommodate your wedding without shortcuts, and if problems arise, they contact you well in advance to resolve any issues. The best man with too much to say and every intent of embarrassing the bride. The uncle insisting on making a speech about family’s longtime loyalty and love, and starting six generations back. To deal with it: People love you and want to wish you the best. They also love to hear themselves talk. Give them a time limit, then your band ushers them off with a wedding song. Guests who just can’t get along bring up old hurts, add new insults and bring on the boxing match. To deal with it: Seat these potential combatants well apart from one another. Insist on good behavior for the day’s duration. 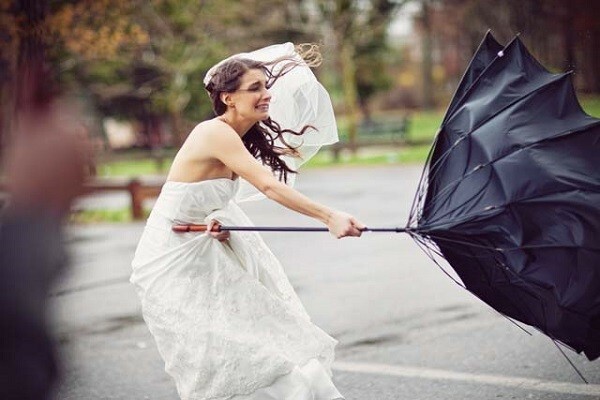 Rain, snow, hail, high winds, even brush fires threaten weddings. To deal with it: Have a backup plan. Your ideal wedding, planned for outside under a tree canopy, is still beautiful if you move inside to escape a torrential downpour. 10) Wait…whose side of the family are you? Auntie Jean thought it was fine to invite a few extra friends to your wedding, so she wouldn’t be lonely. Your brother invited his new girlfriend of two weeks, and she brought her parents. To deal with it: Add 10% additional food to your catering order. This covers the unexpected, uninvited and underfed at home.